This French-designed stage mic costs less than more established models — and might just out-perform them, too! Designed by French company Prodipe, in conjunction with producer Ludovic Lanen, the Lanen MC1 is a hand-held capacitor microphone suited to vocal and instrument use. Although it is intended primarily for live situations, there's no reason not to also use the MC1 for studio recording, where appropriate. Styled similarly to Prodipe's TT1 dynamic microphone and finished all in matte black, the MC1 is built in China to keep costs down, making it very affordable for the gigging musician. It features a separate basket over the capsule inside the main multi-layer basket, to help reduce popping, which it seems to do very effectively, but is otherwise conventional in construction. The cardioid-pattern capsule boasts a frequency response of 30Hz to 20kHz, and 48V phantom power is required. 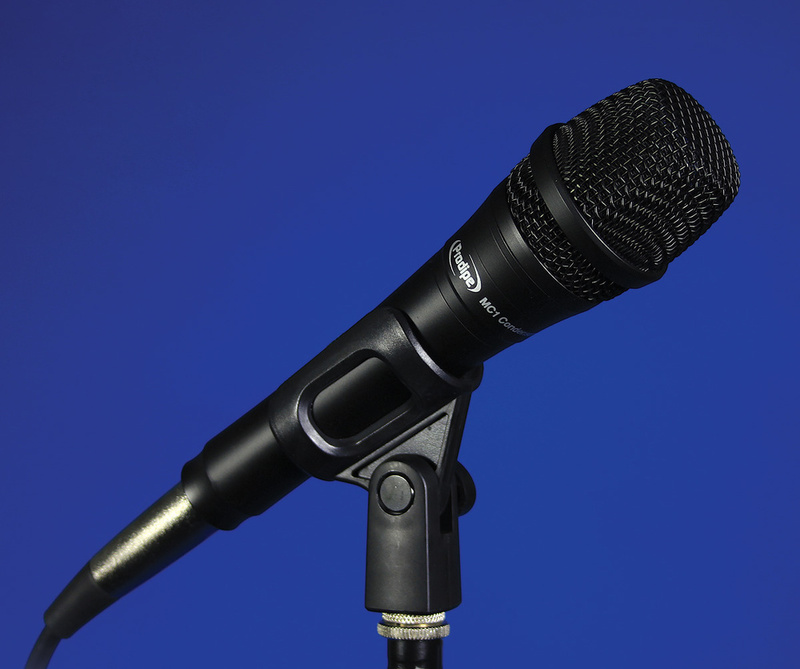 With an Equivalent Input Noise (EIN) of 23dBA, the MC1 is adequately quiet for any normal close-miking application. It can also handle SPLs of up to 125dB (at 1kHz) without complaining. 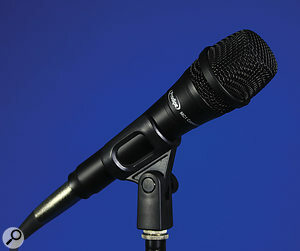 The MC1's sensitivity of -37dB (±3) makes it just a little hotter in output than most other live mics. It comes with a plastic storage pouch and a stand clip, and is very attractively priced, as well as being reassuringly solid. When the Lanen MC1 is used at a distance of 50mm or so, vocals come across as very well-balanced, with a sound that is just a little more open and less nasal than the common choice of dynamic models. I tried the MC1 against my own LD 1011, another hand-held capacitor model, and though it had a noticeably higher output than the LD 1011, the tonality was broadly similar, with perhaps just a very slight improvement in overall clarity and focus. There really wasn't much in it, though, other than the level difference. I also tested the MC1 with an acoustic-guitar combo amp that only provides 24V phantom power. The mic still worked fine, but its sensitivity was considerably less, so I had to crank up the volume more than usual. Nevertheless, it went as loud as feedback would permit, so you could get away with using it with non-standard phantom power at a pinch, although the headroom (and therefore maximum SPL) is probably also reduced at lower voltages. I was particularly impressed by the way this mic managed to resist popping, as the dynamic TT1 model is quite sensitive in that area because of its extended low-end response. Whatever they've done with the multi-layer basket on this MC1 really works. Resistance to feedback is pretty much what you'd expect for a cardioid mic. You still have to be careful where you put your monitors, but it's no more problematic in this respect than a dynamic model. The handling noise is also low enough not to be an issue. The MC1 turns out to be a really good little live mic that is actually cheaper to buy than the more common choices of dynamic model. It sounds good enough to use for budget home recording where quality is still sought, its wide range makes it a practical choice for use on instruments such as acoustic guitar and hand percussion, and it delivers a very credible vocal sound. At the price, it has to be a winner. The Samson CL5 and AKG D5 are two similarly priced models that, like the MC1, will deliver a more extended frequency response than typical dynamic models. Further up the food chain is the H1, from SE Electronics. An affordable, hand-held capacitor mic that delivers high-quality sound, resists popping to an impressive degree, and is built to take the knocks of life on the road. Zen Audio +44 (0)1924 476533. Music Factory Direct +1 888 368 7770.